Last time I was in the Himalayas I was six and travelling to Everest base camp with my family. 12 years later I found myself back in the mountains, on my own this time, working in a small school in a poor, isolated community. To say I felt out of my comfort zone would be an understatement. However, the past weeks have proved to be an incredible, albeit challenging experience and one that I will never forget. I came directly to India from South America where I had been travelling with someone by my side. Within 24 hours I was alone and facing the prospect of a further two months ahead of me. Understanding that the beginning is always the hardest didn’t help me as I struggled to adapt to a new and unknown situation. I was tearful and homesick. The first thing Santa (my project leader, Mondo’s country manager) told me when he noticed that I was nervous and feeling extremely homesick was “you have to get through the hard times to get to the good”. Now, looking back, as I am sat writing this on my flight home, I couldn’t agree more. I have had the most rewarding and incredible experience. I was fortunate to be posted to a village school called Alpha Nursery in Baranumber, two hours from the nearest town. Daunting it may have been, but I need not have worried. Once I met everyone, got settled and started teaching I felt so at home. The Nepali culture is one that is extremely welcoming and kind and I am very grateful for this. Now I can say that I have found another family out here that I feel comfortable and happy to spend time with. I am not a teacher and in fact my whole life I have told myself that I wouldn’t go into teaching. Having said this, working at Alpha Nursery has taught me that being a teacher isn’t about being stuck in a classroom following a textbook, but about building relationships with children and understanding the different ways that kids can learn. Whether it’s interactive learning, teaching outside the classroom or more standard textbook approaches there is always something new and interesting. 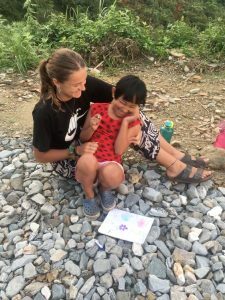 Despite arriving with no teaching experience, I was able to teach basic English, painting, drawing, and games. It has been amazing to put such huge smiles on the faces of pupils. Although I found volunteering daunting at first, the most important thing is to push through to the end. 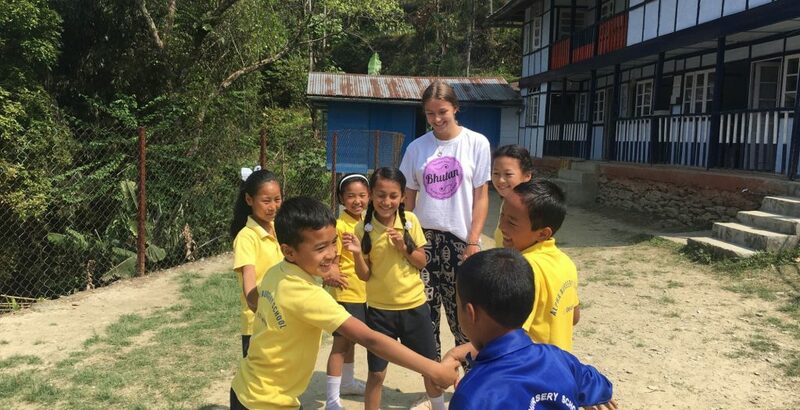 I have grown in confidence, feel more independent and at the same time I’ve made a small change within a school and my host families’ lives. I’m so happy to have had this opportunity and would recommend it to anyone. The team at Mondo have been wonderful and understanding and I am in awe of what they do. There is little doubt that after two months that the person that has come away having learnt the most is me, and for that I will be eternally grateful.